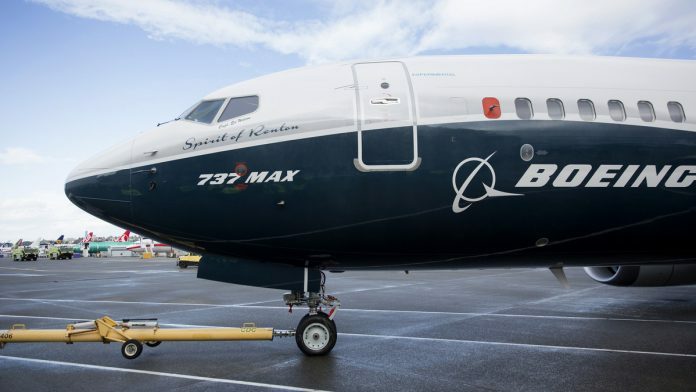 Following the Ethiopian Airlines crash, Boeing is working in a systems upgrade for the 737 Max fleet sitting idle across the world, and will also have to compensate airlines for flight disruptions. Washington/New York/Dallas: The software fix for Boeing Co.’s 737 Max models may end up costing the Chicago-based aircraft manufacturer billions of dollars as it redesigns a computerized flight-control system on hundreds of jets sitting idle around the world. The fixes alone for the revamped version of Boeing’s single-aisle workhorse 737 could cost the company around $500 million if everything is resolved in six to eight weeks, according to Canaccord Genuity analyst Ken Herbert. Delivery delays and reimbursements to airlines for flight disruptions would add another $2 billion in lost cash flow each month the planes are kept on the ground by regulators, Herbert said. Boeing could make much of that money back if deliveries resume promptly. Boeing earlier this week outlined multiple changes it expects to make within weeks as a result of an October crash near Indonesia that raised concerns about an automated safety system on the plane. The urgency of those upgrades heightened significantly on Wednesday when the U.S. joined other nations and grounded the plane after it appeared that similar issues may have played a role in the crash in Ethiopia. If the change is sufficient, this setback “should have very little long-term impact on the success of the Max,” Herbert said. Boeing, in consultation with the U.S. Federal Aviation Administration, will add redundancy and other limits to the Max’s Maneuvering Characteristics Augmentation System, MCAS, so it’s less likely to command the repeated nose-dives preceding the Lion Air crash Oct. 29 that killed 189 people near Jakarta, the company said in a statement Monday. While the FAA and other regulators around the world haven’t said precisely what it will take to get the plane back into the air, one critical thing will be to restore confidence in MCAS. In the Lion Air crash, a faulty sensor at the nose of the plane sent an erroneous warning that the plane’s nose was pointed too high and could plummet out of control because of a loss of lift on the wings, known as an aerodynamic stall. No such danger actually existed. Because the Max, with its bigger engines, was more prone to a stall, Boeing devised MCAS as an additional safety measure. If it sensed a stall in those limited conditions, it didn’t wait for the pilots to act. It commanded the so-called trim system to push down the nose. That confused the Indonesian pilots and they fought the system for more than nine minutes until the aircraft dove into the sea. A preliminary flight track produced by satellites found that the Ethiopian plane made the same series of up-and-down movements during its six-minute flight, according to the FAA. Additionally, a screw-like device that raises and lowers the plane’s nose was found in the wreckage in a position indicating the plane was set to dive, according to a person familiar with the investigation. Boeing’s package of fixes attempts to prevent that from happening again. A single sensor — known as an angle of attack vane — will no longer be capable of triggering an MCAS-induced dive, according to Boeing. The revised MCAS will use inputs from a second sensor to ensure such failures are more rare. The system also won’t act repeatedly if pilots overcome it, according to the company. The Indonesian pilots counteracted MCAS at least two dozen times before the crash. And the revised MCAS won’t make such aggressive nose-down movements, according to the company. In addition, Boeing and the FAA plan to mandate changes in airline flight manuals and to give pilots additional training in how to overcome a malfunction. The union, which represents American Airlines pilots, hasn’t yet received a briefing from Boeing about the changes, Tajer said. “We don’t have an initial objection to the fixes, and they look OK to us,” said Jon Weaks, president of the Southwest Airlines Pilots Association. The union would like to have more detail on the development, control parameters and testing done on the algorithm that would trigger MCAS, he said. It also hasn’t been briefed on the update by Boeing. The Boeing patches to the plane involve only software and don’t require more than about one hour per aircraft to install. Boeing hasn’t commented on compensating carriers, but airlines typically are reimbursed for at least some costs associated with such repairs as well as the inability to use a plane. John Cox, the president of Safety Operating Systems who has participated in multiple crash investigations in his former job as a union representative, said he was confident that the aircraft manufacturer and the U.S. aviation regulator will add adequate fixes to the Max. “Boeing has the expertise and FAA has the expertise and they will come up with an improvement to the airplane and get it back in the air,” Cox said. Boeing declined to comment beyond its public statements, including questions about whether the company could have rushed out a patch before the latest accident. When asked about the time it took to devise an MCAS upgrade, Cox recalled the work he did for the Air Line Pilots Association after an earlier model of the 737 operated by USAir crashed in Pittsburgh in 1994. The National Transportation Safety Board blamed that crash and another one in 1991 in Colorado on a hidden flaw in the plane’s rudder that caused it to suddenly lurch out of control. In that case, Boeing insisted that the plane’s rudder was not to blame and it and the FAA initially resisted redesigning the entire rudder. Years later, they agreed to a redesign and ordered alterations to the rudder. By comparison to those years-long battles, the work on MCAS has been swift, Cox said. What’s more, it’s important not to rush into repairs without considering the consequences, he said. “This is one of the ways that we’ve kept aviation safe is by taking careful, deliberate steps to not introduce more risks than we’re trying to mitigate,” he said.